370 Commonwealth is located on the SW corner of Commonwealth and Massachusetts Avenues, with 362-366 Commonwealth to the east, across Mass. Ave., 374 Commonwealth to the west, 371 Commonwealth to the north, across Commonwealth, and 93 Mass. Ave. to the south. 370 Commonwealth was designed by Harold Field Kellogg, architect, and built in 1925-1926 by the Boyle Robertson Construction Company, on an empty lot, as a nine story apartment hotel, The Eliot. It was built for 370 Commonwealth Avenue Inc., which is shown as the owner on the original building permit application, dated January 5, 1925. 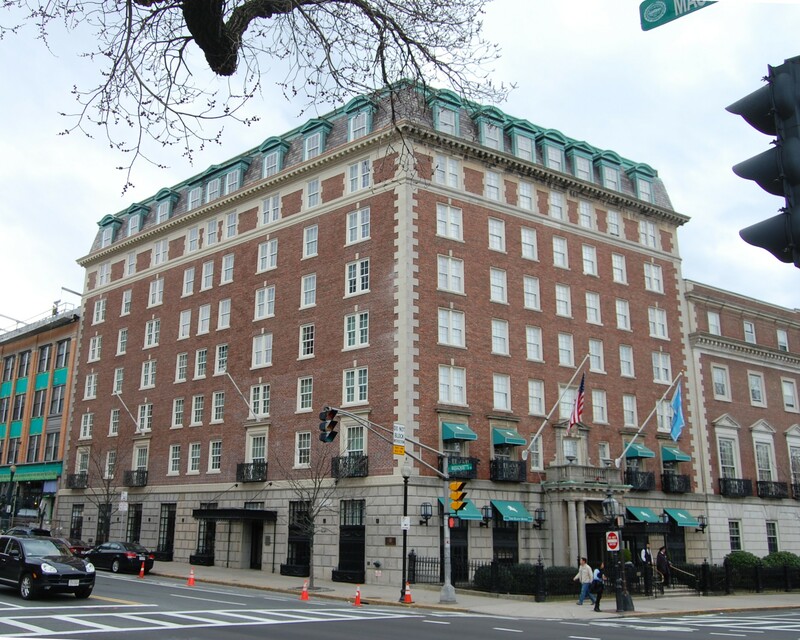 The land on which The Eliot was built was purchased by 370 Commonwealth Ave., Inc., on October 20, 1924, from William H. Agry, trustee of a real estate investment trust that had bought the land in foreclosure on August 19, 1920. 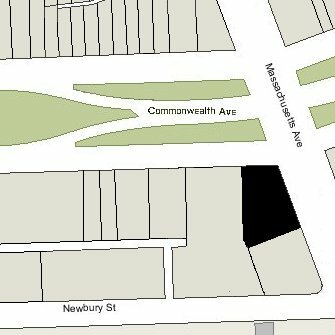 It was part of a larger parcel that extended west from Massachusetts Avenue between Commonwealth and Newbury, including the property where the Sherman Building was built at 93-97 Massachusetts Avenue in 1906 and where the Harvard Club was built at 374 Commonwealth in 1912. This parcel had been assembled in December of 1886 by Henry Lee through purchases combining parts of two larger tracts of land originally purchased from the Boston Water Power Company. Click here for more information on the land on which 370 Commonwealth was built, including an index to the deeds for the property. The Eliot appears to have been planned as an apartment house, and a November 24, 1924, advertisement in the Boston Globe by S. W. Straus & Co., offering mortgage bonds for “The Eliot Apartment Building,” described it as “a modern, high-grade, fireproof, 9-story structure” with “107 suites” of the “best design, materials, and finish.” The January 5, 1925, permit application, however, described the building as a “non-housekeeping hotel” with 91 apartments, which implies that it would be primarily for transient guests. 370 Commonwealth Ave., Inc., defaulted on the bonds it had issued to finance the project, and on December 20, 1928, Olin L. Fuller, as trustee under the bond indenture, foreclosed the mortgage and took possession of the property. In August of 1929, Olin Fuller filed for (and subsequently received) permission to change the legal occupancy from a non-housekeeping hotel to a tenement house. The Eliot thus became a residential hotel (apartments) rather than catering to transient guests. 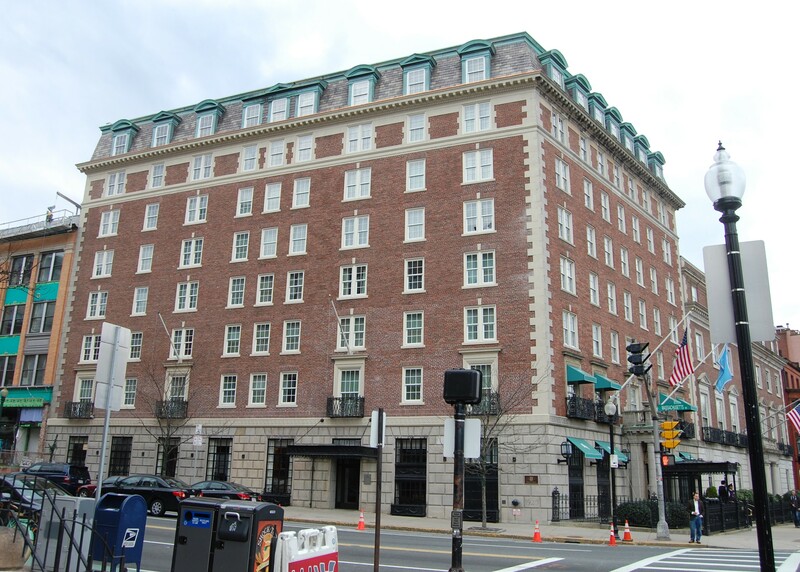 When The Eliot opened in the late 1920s, a branch of the Old Colony Trust Company was located at 83 Massachusetts Avenue, at the corner of Commonwealth, on the first floor and mezzanine of the building. In 1929, Old Colony Trust was acquired by the First National Bank of Boston, and 83 Massachusetts Avenue became a branch of that bank. In addition to the First National Bank, The Eliot also leased space to various shops along Massachusetts Avenue. In 1935, these included the Eliot Pharmacy at 85 Massachusetts Avenue, the Eliot Tailors at 87 Massachusetts Avenue, The Yarn Shop at 89 Massachusetts Avenue, and the Thomas W. Reed Company, dealers in surgical instruments, at 91 Massachusetts Avenue. On May 7, 1930, 370 Commonwealth was acquired from Olin Fuller by Walter R. Moore. On September 18, 1940, 370 Commonwealth was acquired from Walter Moore by real estate dealer Henry C. Brookings, and on December 22, 1942, it was acquired from him by real estate dealer Ray C. Johnson. On December 29, 1942, 370 Commonwealth was acquired from Ray Johnson by Frank Ross and Nathan Ullian. Frank Ross was a real estate, insurance, and mortgage broker; he and his wife, Mildred P. (Ross) Ross, lived in Milton. Nathan Ullian was a real estate dealer and former attorney, and operated the Riverway Manor apartments at 210-214 Riverway. He and his wife, Esther (Neckes) Ullian, lived in Newton. They continued to operate The Eliot as an apartment building. In about 1943. the First National Bank moved from 83 to 91 Massachusetts Avenue, and its former location was vacant for several years. The other shops in The Eliot were The Personal Book Shop at 85 Massachusetts Avenue, the Eliot Flower Shop at 87 Massachusetts Avenue, and The Yarn Shop at 89 Massachusetts Avenue. 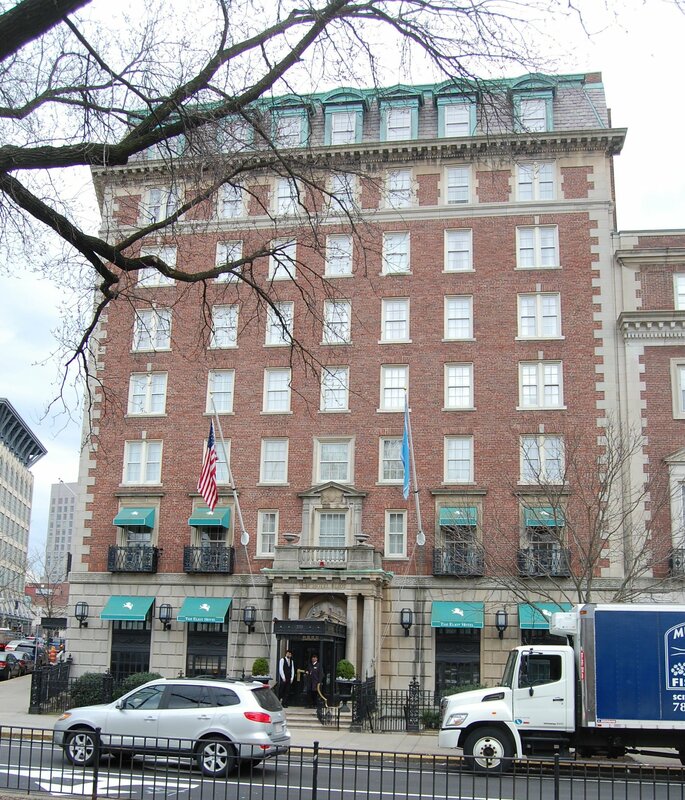 In 1946, 83 Massachusetts Avenue became the Eliot Lounge. In a June 20, 1946, “Spilling the Beans” column, the Boston Globe‘s Joseph F. Dinneen reported that two World War II veterans from Dorchester, Lawrence and Bernard Herman, “pooled their money, went into business with their pre-war boss, and have transformed what was once a bank branch into the Eliot Lounge on Massachusetts av. at Commonwealth.” Their former boss was Paul Bromley, “one time executive of TWA airlines in Boston” with whom the Hermans “had been associated … in various enterprises just before the war.” Paul Bromley and his wife, Eleanor Ayres (Magrane) Smith Bromley, lived at 208 Commonwealth. 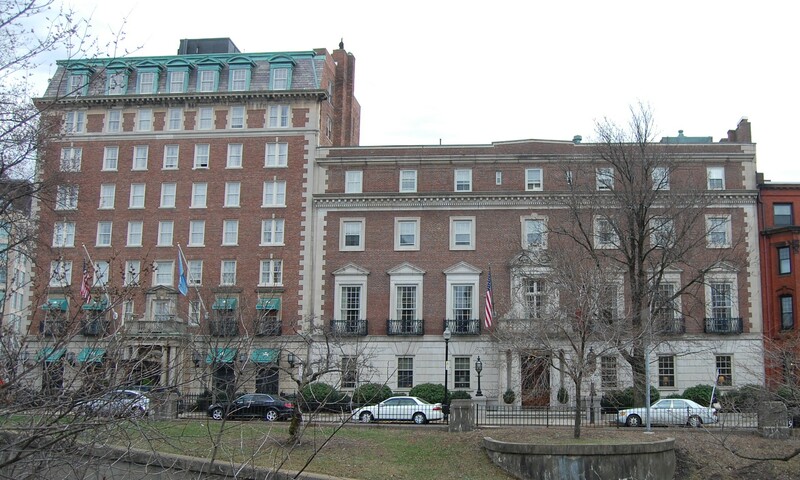 Frank Ross died in March of 1957, and on March 3, 1964, his estate sold their interest in 370 Commonwealth to Riverway Manor, Inc., of which Nathan Ullian was president and treasurer. Nathan Ullian died in July of 1975 and Esther Ullian died in December of 1980. Management of The Eliot was assumed by the Ullians’ son and daughter-in-law, Arthur David Ullian and Dora Z. Ullian. Arthur Ullian inherited the one-half interest in the property held by his father, and on February 10, 1984, Riverway Manor, Inc. transferred the one-half interest it held to a trust for the benefit of Arthur Ullian’s sister, Sandra (Ullian) Davidson, wife of Charles Joseph Davidson. In the late 1980s, the Ullians converted the property from apartments into a hotel, and on December 27, 1990, Arthur Ullian transferred his one-half interest in the property to the Eliot Hotel Associates Limited Partnership, of which he was the sole general partner. The Eliot Lounge remained at 370 Commonwealth, becoming a well-known rendezvous for Boston Marathon celebrations. In closed in late 1996 and was replaced by a restaurant. On June 29, 2016, the Sandra Davidson Trust transferred its one-half interest in 370 Commonwealth to the 370 Commonwealth Avenue Nominee Trust and, on the same day, that trust transferred the interest to the Eliot Hotel Associates Limited Partnership, thereby giving it full ownership of the property. 370 Commonwealth continued to be the Eliot Hotel in 2016.